It seems there are less options for pre-teens and teenagers in Prague - maybe this will change as the baby boom kids (those born 2003 to 2008) grow older. 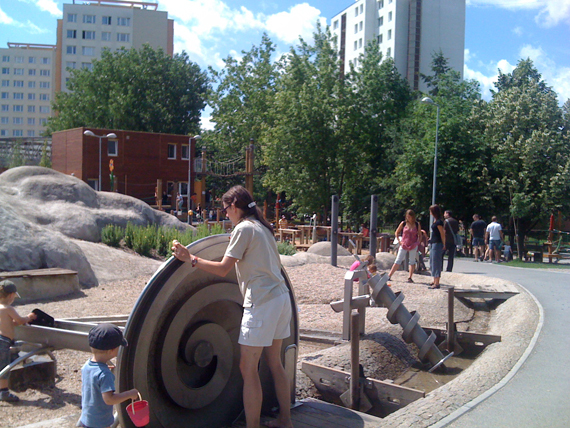 One exception is Areal Gutova (also known as Gutovka) which offers heaps of adventurous activities for kids all ages. 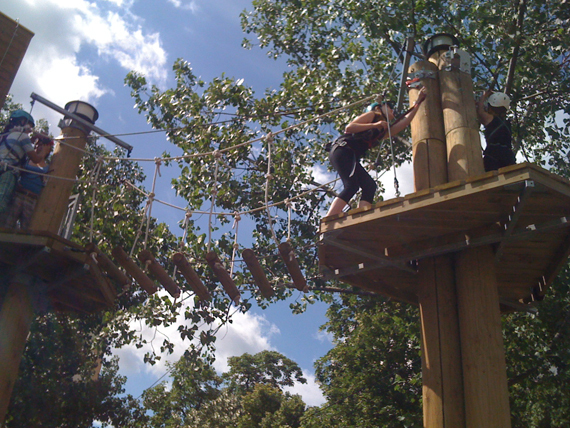 The area has recently expanded and now includes an impressive high wire obstacle course of zip lines rope bridges and climbing frames which require both a harness and helmet for those 10 and above. 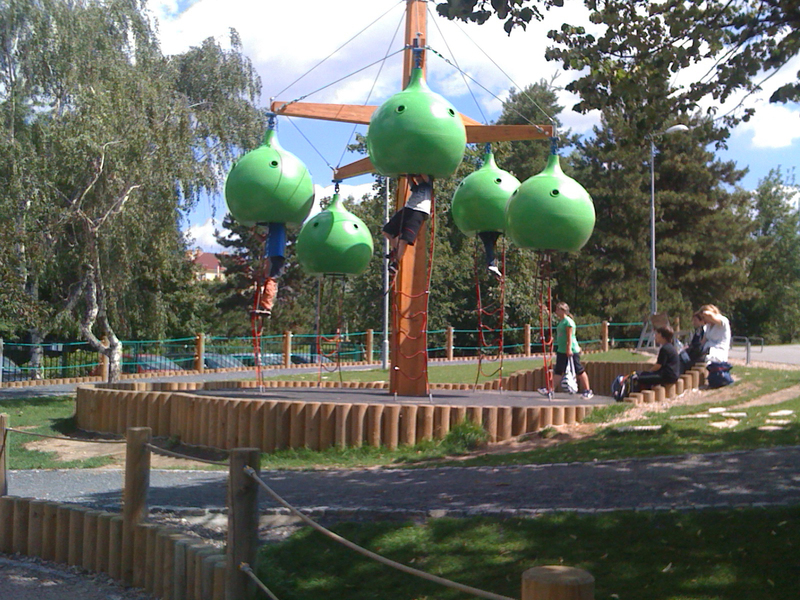 For 70czk kids are fitted with a safety harness and helmet and can zip around this lovely (but challenging) looking course underneath lush green jungle like canopy of trees. When I visited with Ari there were small school groups going through the motions - an end of year school treat that was causing whoops of excitement as they sailed through the trees. It was nice to see the older kids enjoying themselves so much and I could tell the were really tested by all the different challenges the course set them. I wish I’d had this same opportunity going through high school! Further away is a strange looking pod construction with a rope ladder followed by a rope up inside, the idea is that the kid has to have the strength to pull themselves up inside the pod. The pod is free to climb and recommended age for this is 10 and above but I noted that kids as young as 8 were still able to climb up as long as there was a knot tied in the rope. 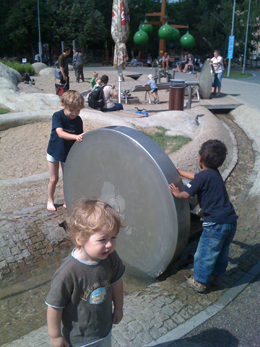 Don’t forget to check out the second playground if you have younger kids, you can see more photos and info here when we covered Gutova a couple of years ago. Please note, the trees and landscaping have made the area much more attractive and protected from the harsh sun. 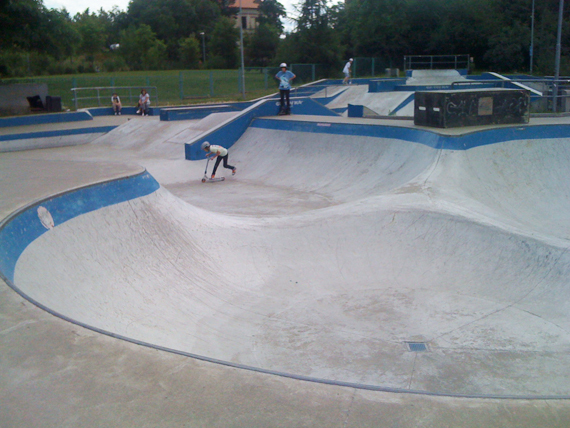 Passing the playground, head onwards to the excellent Skate Park it’s completely free to use and has several bowls, rails, ramps and hills to give even the most skilled skater plenty of challenge. Just going along and watching the kids in action is amazing - their talent on scooters, inline skates and skateboards is awe inspiring. Also on offer is an undercover Inline Rink where you can skate for 20czk per hour plus 40czk an hour to rent on-site all the gear you need. 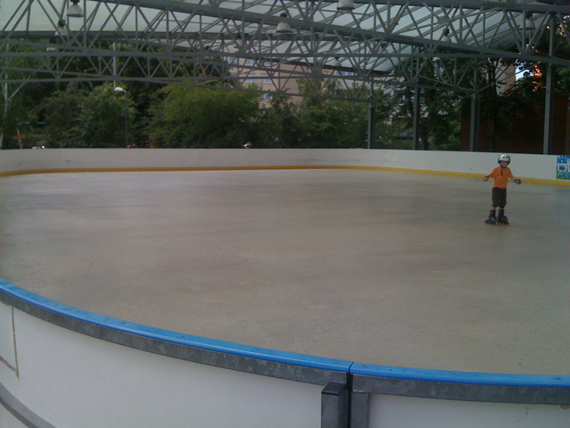 This rink becomes an Ice Rink in winter where you can also go and hire all the necessary gear. 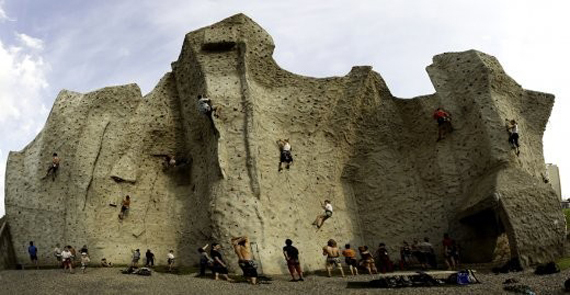 Don’t forget that Gutova has the largest man-made climbing wall in the Czech Republic which physically dominates the whole park. Here you can book an instructor and rent all the gear. 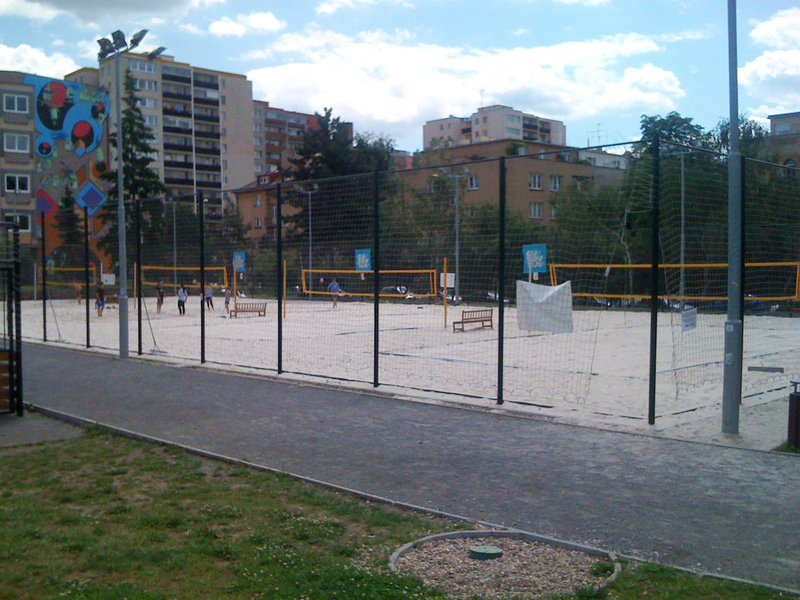 There are also several fantastic beach volleyball courts, football and basketball courts - all available for group hire and offering trainers. Gutovka also has a decent restaurant on-site which has lunch specials from 80 to 100czk plus a kid’s menu. 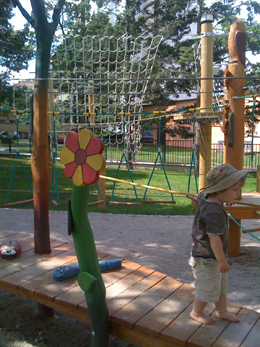 It has an outdoor dining area that overlooks the playground so is very handy for parents. The website below allows you to book lessons and reserve courts (organised by Hamr Sport). This website is partly in English but the on-line reservation system is in Czech and they have more information about the facilities and courses when you go to the Czech part of the website so you may find it easier to get in touch via email or phone or just turn up and enquire. Don’t let the distance put you off visiting, Gutovka is less than 100 metres from the A line Metro and popular tram number 22 and there is also a reasonable amount of parking available if you choose to drive. 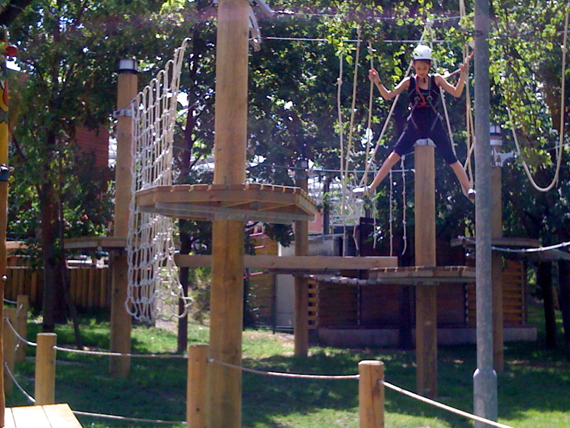 OPEN: Everyday from 8.00am till 11.00pm, The High Wire Course is open from 10am till 10pm. DIRECTIONS: By Metro: Take the green A line to Strasnicka (which has a lift). When exiting take the tunnel outside which leads directly to Areal Gutova this saves you having to tackle stairs and the busy road and it’s only a short 3 minute walk away. By Tram: take numbers 22, 24, or 26 to Na Hroude tram stop or 7, 19 or 26 to Strasnicka tram stop. The area is within quiet residential streets and parking should not be a problem.